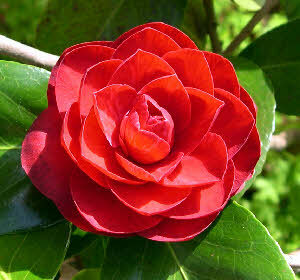 The primary features are the camellias, including a large variety of cultivars. There is an under-planting of bulbs including daffodils, jonquils, bluebells, grape hyacinths, cyclamen, lachenalias, babianas, Pacific Coast (Californian) irises, hellebores, and winter irises. Wisteria, hydrangeas, laburnum arch, roses, rhododendrons, azaleas, and miniature cyclamens also produce a dazzling display at various times of the year. Trees include liquidambar, poplar, holly, eucalypts, magnolias, Japanese maples and oak trees (including a heritage listed English oak over 6m around the girth). The deciduous trees provide a stunning display in autumn. 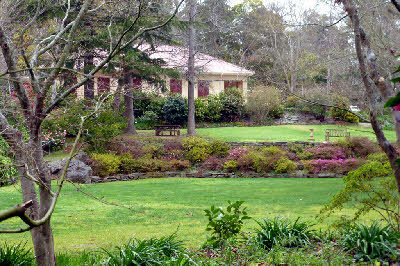 Volunteers of the Camellia Society Adelaide Hills began planting the camellias in 1977 and there are now over 500 cultivars, many of which are not commonly found varieties. The cultivars have been planted in beds grouped to a theme (Miniature, Japonica, Reticulata, Sasanqua, Hybrid, Higo, and Elegans). Examples of varying uses can also be seen, including hedging, espaliers, topiaries, and ground cover. The north-facing hedge, mostly of un-named seedlings from members’ gardens, stands as a testament to ‘camellia hardiness’, having had only ‘water from the skies’ for several years -- mainly winter rains followed by dry hot summers; annual rainfall 25 inches (625mm). ‘Stangate Ruby’ was registered from one of the hedge seedlings. A special feature of the garden are the four old camellias in our ‘Leawood Collection". Estimated to be originally planted c1875 and transplanted to Stangate in 1996, the four now proudly stand in front of the espaliered fence line of alternating 'Setsugekka' and 'Fukuzutsumi', having recovered fully from a heavy chainsaw pruning. Several local cultivars can be seen: ‘Roger Hall’, ‘Marmion’, ‘Maisie Chettle’, ‘Nan Pickering’, ‘Arthur Knight’, ‘Sarah Jane’, ‘Magnolia Blush’, ‘Just Sue’, ‘Wyn Hawkes’, ‘Len Jacobs’, ‘Christian Pink’, and ‘Magalhaes Variegated’. Entry Fee - modest fees apply.